A visit to the HaMeiri Cheese shop in the Old City of Tzfat is, in fact, more of an opportunity to learn about the history of Tzfat than the actual process of cheese-making. "My grandfather's grandfather came here in 1840" Meir HaMeiri, the present proprietor of HaMeiri Cheese states "in the years after the tragic earthquake and subsequent Arab attacks almost destroyed the Jewish community. Emissaries were sent from Tzfat to Jewish communities throughout the world to find support for the decimated and discouraged Jewish community in Tzfat. When one of the emissaries arrived in Iran, my great-great grandfather announced that he would do more than send money to Tzfat....he would bring his family to live there!" "Many villages copied our cheeses" today's Meir HaMeiri said "but the HaMeiri Cheeses of Tzfat were the originals." The dairy, HaMeiri Cheeses of Tzfat, uses sheep's' milk to produce their unique brand of delicious salty and smooth cheese, and the center is in the same building where it all began in 1840. 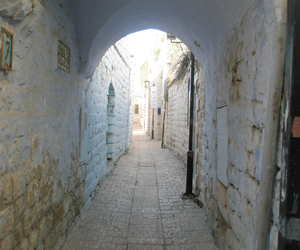 Upon entering the building, the first thing to draw one's attention is the passageway, in which hundreds of original photos hang, which tell the story of the Jewish settlement of Tzfat over the last 200 years. Photos of Rabbis, schoolchildren, families, and soldiers are hung, interspersed with photos showing the everyday lives of Jews who lived in Tzfat. The large HaMeiri family occupies some of the space, but if one gives time to perusing the photographs, one can understand the evolvement of the Jewish community from the time of the first Meir HaMeiri to his great-great-great-grandson, Yaniv, who has recently returned from Tel Aviv to enter the family business. "I thought that the business would end with me" Meir says. "When my great-great grandfather established the business, he dictated that the building, and the business, would only pass to one son in each generation. The names Meir and Shlomo would interchange in each generation, and those would be the sons who inherited, no matter how many sons there were. So, the original Meir HaMeiri passed the business to his son Shlomo, he to my grandfather Meir, he to my father Shlomo, and he to me. My son Shlomo would be unable to manage such an enterprise, and all my other children had moved out of Tzfat and established themselves in other areas of Israel, so I assumed that when I closed down, the business would end. But two years ago, my son Yaniv decided to return to Tzfat and accept responsibility for taking on the management of the business. So I see that there will be another generation here, and the Tzfat Cheeses will continue for some time." Why are the HaMeiri Tzfat cheeses so special? Why has no other producer been successful in duplicating the unique texture and taste of the HaMeiri Cheeses? "It all comes down to the personal touch" Meir explains. "Our sheep graze in the open....they're not confined to pens or given commercial feed to eat. They are hand-milked, so that they enjoy human touch. And we play music for them, to calm them and insure that their milk reflects their own contentment and well-being." These are not things that would be heard of in the largest dairies, but the HaMeiris aren't interested in being the largest. Numerous generations of HaMeiri Cheeses can attest to the HaMeiri's success.